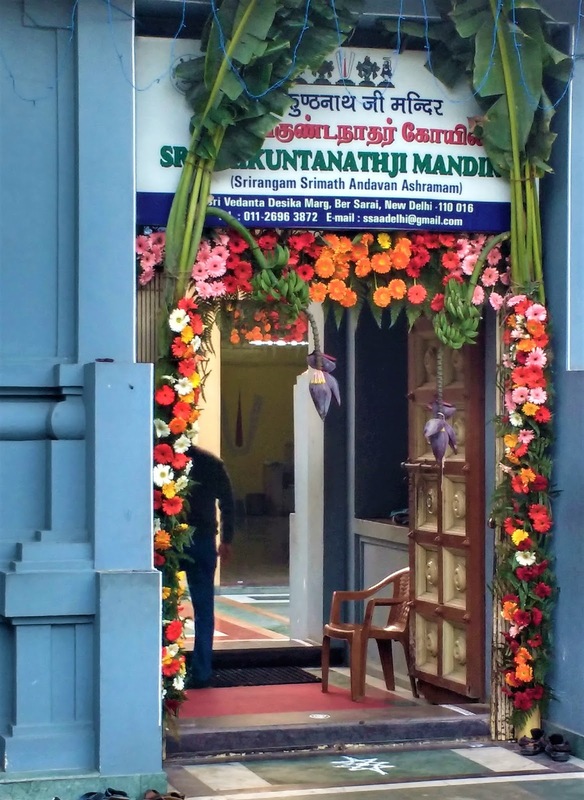 I was on my way back from the morning walk today when I saw the Vaikunthnathji Temple near my house decorated with different colours and kinds of flowers. It was a beautiful sight to behold. I know that Tamil and Malayalam Hindu weddings takes place in the morning, so I guessed that there might be a wedding scheduled there. What also captured my attention was that there were 2 bunches of bananas along with their flower at the tip hanging beautifully adorning the entrance of the Temple along with the other flowers and the decorations. It symbolizes 'eternal' life'. The banana (plantain) plants, known in Tamil as vāḻai (வாழை), produce baby plants (apparently invariably) and thus symbolizes the unfailing succession of offspring, generation after generation. The Tamil phrase used in belssing, 'vāḻaiyaṭi vāḻai' (வாழையடி வாழை) literally means like a baby plant by the side of a banana plant - symbolizing the eternal succession of offspring. The very word for the plant vāḻai, (வாழை) means life ('ever-living-life'). Hence very auspicious. The word vāḻ (வாழ்) means 'to live'. The word vāḻai (வாழை) means that which lives (for ever). If there is anyone else with some other answers to this question, do reply or add in your comment below!